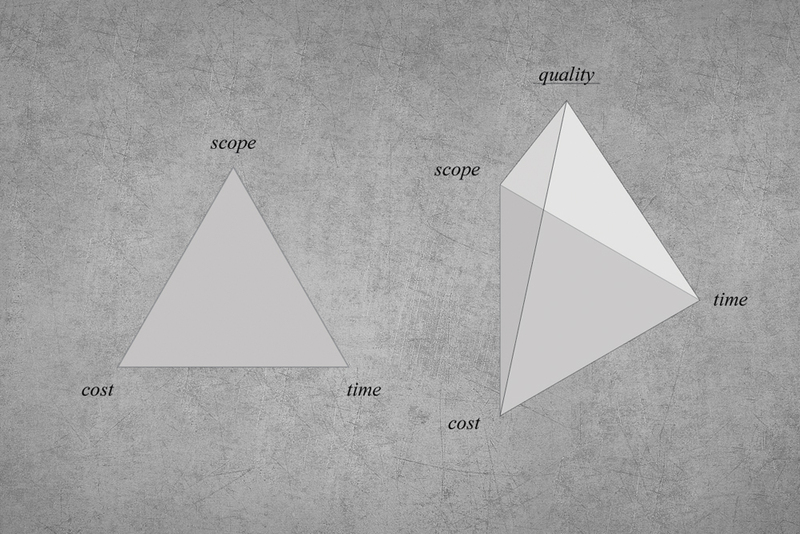 A familiar project management tool, in its simplest guise represented by a triangle with scope, cost and time at each of its vertices. 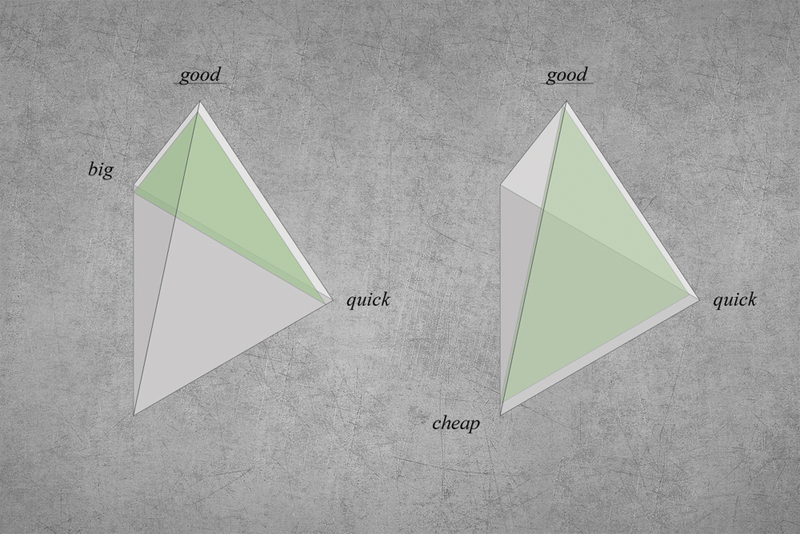 On design projects, the triangle is actually a triangular pyramid, with quality added at the fourth vertex. 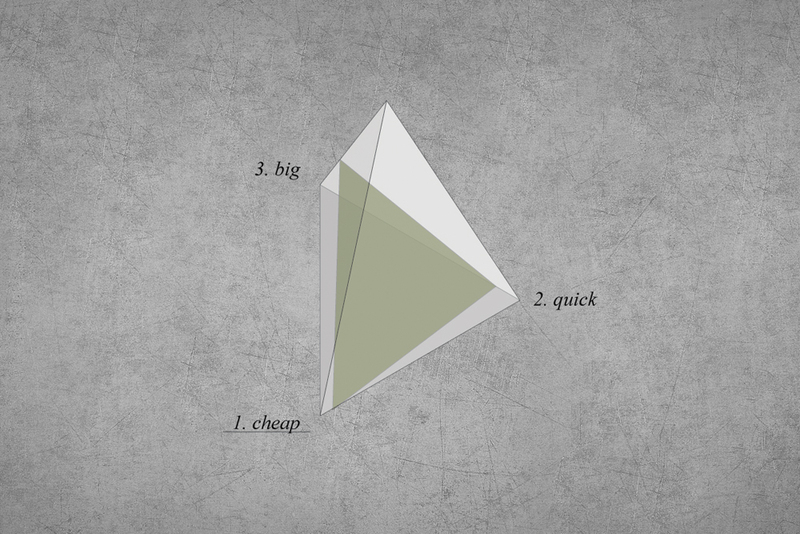 The iron pyramid’s principle is that on any project it is only possible to achieve three of these four goals: a project may be good, big and quick, but not cheap; or it may be cheap, quick and good, but not big. The architect‘s priorities are scope and quality, the two potentially interchangeable depending on the project and the client. This is embodied in our values, charged as we are with the responsibility to provide design solutions for our clients’ briefs. It is embodied in the documents we produce: our drawings, models and specifications all describe the scope and quality of a design. It is embodied in the building contracts we administer, where our role first and foremost is to ensure builders are faithful to our documents. This is not to say that the architect is neglectful of cost. Our projects live and die by the limitations of our clients’ budgets. To act responsibly, in accordance with The Architects Act and in keeping with good business sense, we must respect the economic realities of our projects. It is a matter of self-interest also: only when our projects are built and our clients satisfied do we stand the chance of winning future commissions. Time, admittedly, is the architect’s lowest priority. The unique conditions of each of our projects demand prototypical responses, the production of which cannot be achieved quickly. Making architecture is like investing all the research and development that goes into designing a new car, but then building it only once. Ultimately, we are content to dedicate the time necessary to achieve a good design outcome. We unfortunately live in a country and era where scope and quality are the priorities of neither the construction industry in which we operate, nor many of the clients that commission our services. The evolution of Australia’s $100b construction industry may be beyond the control of the architecture profession, but we only have ourselves to blame for our atrophying role in its largest projects. During the financial boom of the 1980s, the architecture profession made a significant tactical error. With too much work to handle, we began refusing to work on the building phase of projects. At a crucial time in the history of construction, just as private speculative development came to dominate the industry, we shunned the construction site for the drawing board. Inevitably, a new occupation materialised to fill the hole left by our snobbery. More than happy to slum it with the builders, the project manager quickly developed sufficient construction fluency to replace us on site. The importance of the architecture profession has since steadily receded while that of the project manager has exploded. Salaries are hardly the only measure of success, but they do reveal a great deal about perceived value. The My Career summary of average construction industry wages in Australia reveals that the average annual salary for architects is $82,000, while for the project manager it is $134,000. The minimum and maximum indices tell the same story: $40,000 and $200,000 for architects; $60,000 and $250,000 for the project manager. Today’s architecture profession is shaped as strongly by this shift as any other. The project manager not only earns more than we do, he is usually given the role of running the projects on which we work, and is empowered to decide which of our contributions are included and which are rejected. He has not only replaced us on site, he is the conduit to the most important person on a project, the client, guiding her very agenda. Why has the project manager been so successful? The project manager‘s raison d’être is to prioritise cost. Given the speculative nature of the majority of his projects, by prioritising cost he is by definition also prioritising time. Scope comes third and quality a distant fourth. This order of priorities frames every decision he makes, from selecting construction systems that permit faster erection times, to details that permit off-site assembly, to design solutions that maximise gross floor area. The project manager is successful because he understands and responds to the zeitgeist of the construction industry. Scope and quality are luxuries: even beyond the speculative apartment market, financial control and risk minimisation are regularly the starting conditions of any project. Todd Reisz in Rory Hyde’s deeply engaging book, Future Practice: Conversations from the Edge of Architecture, observed how entire cities within the Middle-East are being planned and executed not by architects, nor even project managers, but by bankers. Within our downturned economic climate, the people and organisations commissioning new buildings are more cautious than they have ever been. The elements of a building considered essential have contracted, with design quality relegated to image-making artifice. In a world where everyone borrows to build, cost and time are king, and the project manager is the guardian of both. Since at least the time when we were at University (and really, since the collapse of the great Modernist experiment), the architecture profession has been in a state of crisis. It is arguably remarkable that we’ve survived so many decades on the brink of doom, but it would be naïve to ignore the signs of peril around us. Our fees and salaries are increasingly insufficient; we are forced to share a shrinking slice of the construction pie; we are overlooked by government, media and the public; and most crazy of all, we value our work more than the people who use it. By and large, the world survives without architects. The zeitgeist, it is not surprising to discover, has moved on without us. The great innovators of the era, the shapers of our daily environments, the future visionaries, are no longer architects. We live in an era where the city-builders are the moneymen. Design might be tentatively re-entering the social conscious in Australia, but more often than not, it is within the project manager’s order of priorities. With housing becoming an “investment opportunity rather than a basic human right”, where are the architects? What are we doing to impose our values on this trend? Well, we do make buildings. Our design output is our most significant contribution to the fabric of the city. It is certainly our best opportunity to demonstrate best practice, shape current trends and create new ones. But take a look around: fantastic buildings are being built every year, in every country on the planet, yet they have little effect on the pecking order on site, on the decisions that get made in boardrooms, on the importance of architecture in the public’s eye. The crisis of architecture does not originate in what we do, but in how we do it. We are talking about architecture practice here: the skills we develop; the frameworks of our businesses; the relationships we nurture; the services we offer and the way we charge for them. If we are to take one lesson from the success of the project manager it should be that we need to learn how to become indispensable. One does not self-prescribe medicine or self-represent at a court hearing. Doctors and lawyers are indispensable, why aren’t architects? The solution will begin with good design, and with the unique world view offered by our profession. If the construction industry and general public aren’t interested in good design, we must try to change their minds instead of sulking about it. It is estimated that around 95% of all new houses in Australia never pass under the eyes of an architect. It’s not hard to see why: volume builders build at less than half the rate per square metre of architect-designed houses. By thumbing our noses at the great unwashed, we are hastening our own extinction. If we don’t like the zeitgeist, if we don’t like novated contracts, if fringe suburbs of soulless McMansions make us ill, if cities designed by the profit imperative is not to our liking, we can’t wait for someone else to fix it. We need do it ourselves. We have spoken before about what an architect is and what we can do to arrest the inexorable slide towards architectural poverty, but to become indispensable we need to think way outside the box. We need to take our heads out of our architecture journals, our pilgrimages to Falling Water, our awards processes. We need to do things differently. We need to lobby government or even better, run for government. 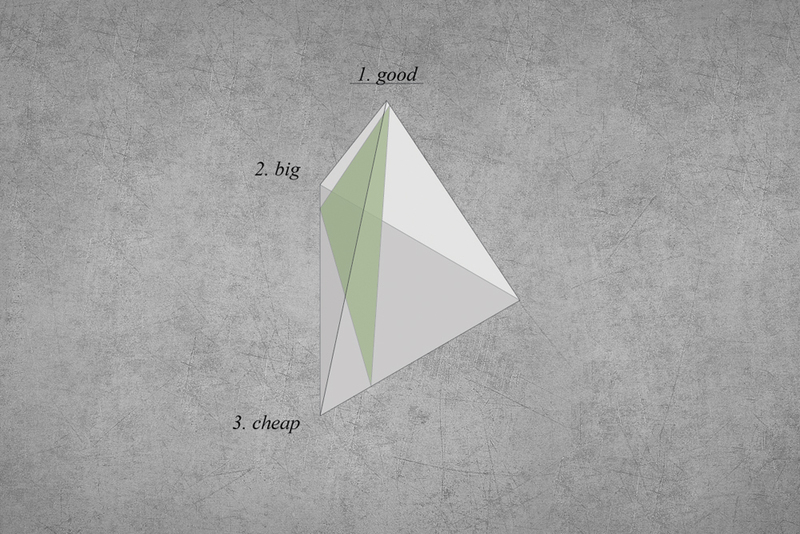 We need to push better design into the speculative markets or even better, finance the speculative markets ourselves. We need to expand what we do, relearn how to build or learn how to code. The architect of the 20th Century is dying, it’s about time we start defining the architect of the 21st. This is true primarily of larger building projects e.g. multi-residential, office and tower typologies. The elements of architectural activity most immune tend to be the smallest e.g. residential and hospitality typologies, or the most unique e.g. places of worship and public buildings. Paul Pholeros, a Sydney-based architect in practice for 30+ years, discussed the erosion of the architect’s responsibilities during Community and Architecture, the keynote address of Melbourne Architecture Annual 2012. The average cost of an architect-designed house is $4,970 per square metre. BMT Quantity Surveyors estimate that the cost of the average home is around $1,700 per square metre. Iron triangle and iron pyramid. Author’s own image. Big good and quick, and cheap quick and good. Author’s own image. The architects’ priorities. Author’s own image. The project manager’s priorities. Author’s own image. 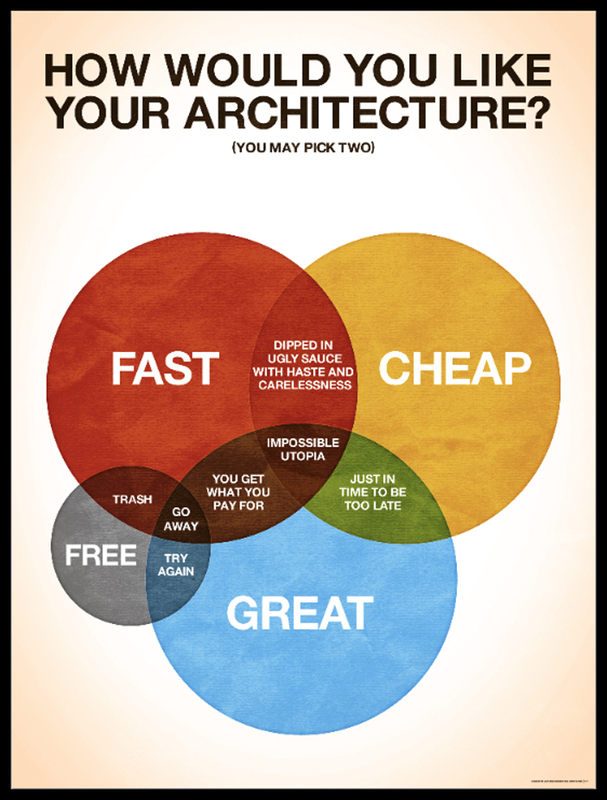 How would you like your architecture? Colin Harman. Copyright Colin Harman. We are definitely looking to expand our range of services with an eye to demonstrating expertise across the widest possible breadth of issues relating to space and building. I’m guessing that in Australia as in the U.S. project managers do not have their own License Act. That being the case you can always provide those services yourself.